This article is about the American football team from 1920 to 1959. For the history of the team from 1960 to 1987, see History of the St. Louis Cardinals (NFL). For the current team (since 1987), see Arizona Cardinals. For the Continental Indoor Football League team (2008–2010), see Chicago Knights. First logo, introduced in 1920 and used until 1934. The professional American football team now known as the Arizona Cardinals previously played in Chicago, Illinois. This article chronicles the team's history during their time as the Chicago Cardinals from 1920 to 1959. In 1898, Chicago painting and building contractor Chris O'Brien established an amateur Chicago-based athletic club football team named the Morgan Athletic Club. O'Brien later moved them to Chicago's Normal Park and renamed them the Racine Normals, since Normal Park was located on Racine Avenue in Chicago. In 1901, O'Brien bought used maroon uniforms from the University of Chicago, the colors of which had by then faded, leading O'Brien to exclaim, "That's not maroon, it's cardinal red!" It was then that the team changed its name to the Racine Cardinals. The Chicago Cardinals in 1920. At the time of the founding of the modern National Football League, the Cardinals were part of a thriving professional football circuit based in the Chicago area. Teams such as the Decatur Staleys, Hammond Pros, Chicago Tigers and the Cardinals had formed an informal loop similar to, and generally on par with, the Ohio and New York circuits that had also emerged as top football centers prior to the league's founding. The Staleys and Cardinals played each other twice in 1920 as the Racine Cardinals and the Decatur Staleys, making their rivalry the oldest in the NFL. They split the series, with the home team winning in each. In the Cardinals' 7-6 victory over the Staleys in their first meeting of the season, each team scored a TD on a fumble recovery, with the Staleys failing their extra point try. The Cardinals' defeat of the Staleys proved critical, since George Halas's Staleys went on to a 10-1-2 record overall, 5-1-2 in league play. The Akron Pros were the first ever league champions; they finished with an 8-0-3 record, 6-0-3 in league play, ending their season in a 0-0 tie against the Staleys. Since the Pros merely had to tie the game in order to win the title, they could afford to play not to lose. Had the Staleys not lost to the Cardinals, they would have gone into that fateful game with an 11-0-1 record, 6-0-1 in league play. As it was, it all but assured that the Staleys/Bears and Cardinals would be intense rivals. The two teams played to a tie in 1921, when the Staleys won all but two games, thus the Cardinals came within 1 point of costing the Staleys a second consecutive championship in the league's first two years of existence. In 1922, the Staleys, now renamed the Bears, went 9-3-0, losing to the Cardinals twice. The Bears still edged the Cardinals for 2nd place in the league, but those losses dashed all hopes of the Bears repeating as champions. In 1923 and 1924, the Bears got the better of the Cardinals all three times the two teams played. But in 1925, the Bears went 0-1-1 against the Cardinals with the tie meaning the Cardinals were only a ½ game in front of the Pottsville Maroons heading into their fateful 1925 showdown. Thus, in the first 6 years of the NFL's existence, the Bears-Cardinals games had a direct impact on the league championship 4 times. The Bears and Cardinals each took home 1 title during that span. But the Bears nearly cost the Cardinals their title, the Cardinals nearly cost the Bears their title, and had it not been for the Cardinals' tenacity against the Bears, the Bears very well might have won two more. The Bears were a dominant team against everyone but the Cardinals in the league's early years. From 1920-1925, the Canton Bulldogs, champions in 1922 and 1923, beat the Bears just 2 times and no other team in the NFL defeated the Bears more than once over that entire 6-year span... except for the Cardinals. The Cardinals battled the Bears to 4-4-2 split between 1920–1925 and established the NFL's first rivalry. Legend has it that the Cardinals played the Chicago Tigers in 1920, with the loser being forced to leave town. While this has never been proven, the Tigers did disband after one season. The 1925 season ended in perhaps the greatest controversy in professional football history. In those days, there was no fixed schedule nor any playoff games. The championship was decided by winning percentage. At season's end, after losing in a Chicago snow storm to the Pottsville Maroons 21-7, the Cardinals found themselves in second place. Hoping to improve their record, they scheduled and won two hastily arranged games against weaker teams, the Milwaukee Badgers and the Hammond Pros. The ploy was within the NFL’s rules at the time because of the open-ended schedule. Chicago finished the season with a record of 11-2-1. However, the league sanctioned them because a Chicago player, Art Folz, had hired four Chicago high school football players to play for the Milwaukee Badgers under assumed names to ensure a Cardinals victory. The Chicago Cardinals were one of the few NFL teams to host African-American players in the 1920s—most notably Duke Slater. After the folding of the first American Football League after its lone season, Slater, against all odds, successfully joined the Chicago Cardinals of the National Football League. Not only was Slater pro football's first African-American linemen, he was also one of the NFL's most outstanding linemen of his era. In 1928, he encouraged the team to sign Harold Bradley Sr., who became the NFL's second black lineman. Slater and Bradley played alongside each other in the first two games of the 1928 season. A steel plate in Bradley's leg, due to a childhood injury, contributed to Bradley ending his NFL career after only two games—the shortest among the 13 African American players who played in the NFL before World War II. Between 1926 and 1927 a movement began among the owners of the NFL to follow the racist example of professional baseball and in 1927 every African-American player was out of the league, with the sole exception of Duke Slater. The color ban faced by Slater and other black players was not ironclad, however, and four other African-American players managed to draw salaries in the NFL during short careers interspersed from 1928 through 1933. Slater was once again the only black player in the league in 1929. On November 28, 1929 Slater participated in an NFL record as a lineman in front of Ernie Nevers in a game in which he scored six rushing touchdowns in a 40-6 victory over the Chicago Bears. Slater played all 60 minutes of the contest, alternating between the offensive and defensive lines as well as participating on special teams. By the time of his retirement in 1931, Slater had achieved All-Pro status a total of six times. During his NFL career Slater never missed a game because of injury, starting in a total of 96 of the 99 games he played between the AFL and NFL. The Cardinals posted a winning record only twice in the twenty years after their 1925 championship (1931 and 1935); including 10 straight losing seasons from 1936 to 1945. Dr. David Jones bought the team from O'Brien in 1929. 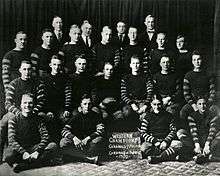 In 1932 the team was purchased by Charles Bidwill, then a vice president of the Chicago Bears. The team has been under the ownership of the Bidwill family since then. In 1944, owing to player shortages caused by World War II, the Cardinals and Pittsburgh Steelers merged for one year and were known as the "Card-Pitt", or derisively as the "Carpets" as they were winless that season. In 1945, the Cardinals snapped their long losing streak (an NFL record 29 games, dating back to the 1942 season and including their lone season as Card-Pitt) by beating the Bears 16-7. It was their only victory of the season. In 1946, the team finished 6-5 for the first winning season in eight years. In 1947, the NFL standardized on a 12-game season. This would be the most celebrated year in Cardinals history as the team went 9-3, beating Philadelphia in the championship game 28–21 with their "Million Dollar Backfield", which included quarterback Paul Christman, halfback Charley Trippi, halfback Elmer Angsman, and fullback Pat Harder, piling up 282 rushing yards. However, Bidwill was not around to see it; he'd died before the season, leaving the team to his wife Violet. He had, however, beaten the Chicago Rockets of the upstart All-America Football Conference for the rights to Trippi. This signing is generally acknowledged as the final piece in the championship puzzle. The next season saw the Cardinals finish 11-1 and again play in the championship game, but lost 7-0 in a rematch with the Eagles, played in a heavy snowstorm that almost completely obscured the field. This was the first NFL championship to be televised. The next year, Violet Bidwill married St. Louis businessman Walter Wolfner, and the Cardinals fell to 6-5-1. The 1950s were a dismal period for the Cardinals, with records of 5-7 (1950), 3-9 (1951), 4-8 (1952), 1-10-1 (1953), 2-10 (1954), 4-7-1 (1955), 7-5 (1956; the best year of the decade), 3-9 (1957), 2-9-1 (1958), and 2-10 (1959). With just 33 wins in ten seasons, the Cardinals were nearly forgotten in Chicago, being completely overshadowed by the Bears. Attendance at Cardinals games was sparse. With the team almost bankrupt, the Bidwills were anxious to move the Cardinals to another city. However, the NFL demanded a hefty relocation fee which the Bidwills were unwilling and/or unable to pay. Needing cash, the Bidwills entertained offers from various out-of-town investors, including Lamar Hunt, Bud Adams, Bob Howsam and Max Winter. However, these negotiations came to nothing, probably because the Bidwills wanted to maintain control of the Cardinals and were only willing to sell a minority stake in the team. The Chicago Cardinals have the distinction of being the only team in American professional football history to score exactly 4 points in one game. On November 25, 1923, the Cardinals lost to the Racine Legion 10-4. ↑ "Arizona Cardinals | American football team". Encyclopedia Britannica. Retrieved 2016-10-08. Wikimedia Commons has media related to Chicago Cardinals.